A sharp-eyed camera aboard NASA's Mars Reconnaissance Orbiter has spotted the Phoenix lander encased in dry ice in the depths of winter on the northern polar plains of Mars. MRO's High Resolution Imaging Science Experiment, or HiRISE, camera captured images on July 30 and Aug. 22 before the orbiter's science activities were halted by a safe mode in late August. The pictures show Phoenix covered in carbon dioxide frost just before the predicted peak in ice coverage in September. Phoenix touched down in May 2008 in the Martian arctic plains at 68 degrees north latitude. Scientists last heard from the lander last November as autumn set in at Mars' northern hemisphere and sunlight levels dropped. The carbon dioxide ice later encroached on the landing site and enveloped the spacecraft. The HiRISE camera collects the most detailed imagery of Mars ever obtained from orbit. The instrument can discern objects as small as 30 centimeters, or less than 1 foot, from an altitude of nearly 200 miles. HiRISE took the picture of Phoenix under poor lighting conditions and a blanket of haze restricting visibility at the surface. 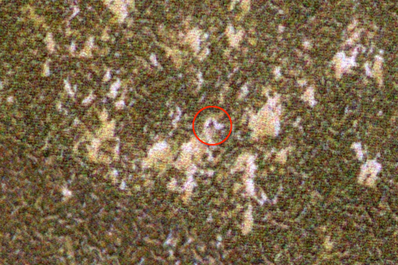 The camera already imaged the lander shortly after it arrived at Mars in 2008, so analysts were able to compare the pictures to pick out the spacecraft. "The power of the HiRISE camera helped us see it even under these poor light conditions," said Michael Mellon of the University of Colorado in Boulder, a member of both the HiRISE and Phoenix science teams. The dry ice coverage increased in the Aug. 22 image as northern Mars reached late winter and the frost reached its maximum extent. Spring began Oct. 26 and the frost should begin retreating over the next few months. Scientists will attempt to contact Phoenix early next year as sunlight returns to the plains, but the odds of regaining communications with the frozen lander are slim.